Buddhist relics on display in Mandalay, Burma. A relic (from Latin: reliquiae meaning 'remains') is a venerated object of religious and/or historical significance, often the human remains of an important religious figure, or a sacred item, carefully preserved as a tangible memorial. Relics are an important aspect of many religions including Buddhism, some denominations of Christianity, Hinduism, shamanism, and many other personal belief systems. A reliquary is a shrine that houses one or more relics. A relic is also the term for something that has survived the passage of time, especially an object or custom whose original culture has disappeared, but also an object cherished for historical value (such as a keepsake or heirloom). At Athens the supposed remains of Oedipus and Theseus enjoyed an honor that is very difficult to distinguish from a religious cult, while Plutarch gives accounts of the translation of the bodies of Demetrius (Demetrius iii) and Phocion (Phocion xxxvii), which in many details anticipate Christian practice. The bones or ashes of Aesculapius at Epidaurus, and of Perdiccas I at Macedon, were treated with the deepest veneration, as were those of the Persian Zoroaster, according to the Chronicon Paschale (Dindorf, 67). However; there is no tradition in Zoroastrianism, nor its scriptures, to support this postulation. In Buddhism, relics of the Buddha and various saints were (and still are) venerated. Following the Buddha's death, his bones and teeth were divided for the purpose of being used as relics in order to illustrate his teaching of impermanence (anitya). These relics were so valued that they caused armed conflict between factions for possession of them. Afterward, these relics were taken throughout Asia with the gradual spread of Buddhism. Many Buddhist relics (especially bones and teeth) are kept in stupas (buildings created specifically for the relics). Many Buddhist temples have stupas and the placement of relics in a stupa often became the initial structure around which the whole temple would be based. Today, many stupas also hold the ashes or ringsel of prominent/respected Buddhists who were cremated. Some relics believed to be original relics of Buddha still survive including the much revered Sacred Relic of the tooth of the Buddha in Sri Lanka. The Buddha's relics serve to inspire people that enlightenment is possible, and also to promote good virtue. The supposed footprint of the prophet Muhammad, found in a mausoleum in Istanbul. Although certain sects of Islam strongly discourage (or outwardly prohibit) the veneration of relics, a very large collection of Muslim relics is preserved in the Sacred Trusts, located in Istanbul, which contains more than 600 treasured pieces in the Topkapi Palace Museum. Muslims believe that these relics include the sword and standard of Muhammad, a hair from his beard, and the staff of Moses. Most of the trusts can be seen in the museum, however, the most important of them can only be seen during the month of Ramadan. The Qur'an has allegedly been recited next to these relics uninterruptedly since they were brought to the Topkapi Palace. Since the dawn of Christianity, relics have been an important part of Christian devotionalism. During the Middle Ages, the selling of relics became a lucrative business. The concept of physical proximity to the “holy” was considered extremely important. A pilgrim's possession and veneration of a relic was seen as a means to become closer to God. Instead of having to travel hundreds of miles to become near to a venerated saint, a Christian could enjoy closeness with him/her through their relic at home. Another often cited passage is Acts 19:11–12, which says that Paul's handkerchiefs were imbued by God with healing power. There are also many relics attributed to Jesus, perhaps most famously the Shroud of Turin, which is claimed to be the burial shroud of Jesus, although this is disputed. Pieces of the True Cross were one of the most highly sought after such relics; many churches claimed to possess a piece of it, so many that John Calvin famously remarked that there were enough pieces of the True Cross from which to build a ship, although a study in 1870 found that put together the claimed relics weighed less than 1.7kg (0.04m³). The Image of Edessa was reputed to render that city impregnable. Opposed to this holy "virtue" was also a false mystic potency that emanated from inhabiting demons who were conceived of as alien and hostile. Truly holy virtus would defeat it, but it could affect natural phenomena and effect its own kinds of miracles, deceitful and malignant ones. This "virtue" Gregory of Tours and other Christian writers associated with the devil, demons, soothsayers, magicians, pagans and pagan gods, and heretics. False virtus inhabited images of the pagan gods, the "idols" of our museums and archaeology, and destroying it accounts for some of the righteous rage with which mobs of Christians toppled sculptures, and smashed classical bas-reliefs (particularly the faces), as our museums attest. When Saint Martin died, November 8, 397 C.E., at a village halfway between Tours and Poitiers, the inhabitants of these cities were well ready to fight for his body, which the people of Tours managed to secure by stealth. The story of the purloining of Saint Nicholas of Bari is another example. 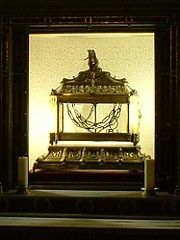 The Chains of Saint Peter, preserved in San Pietro in Vincoli, Rome, a second-class relic. 1.First-Class Relics: Items directly associated with the events of Christ's life (manger, cross, etc. ), or the physical remains of a saint (a bone, a hair, a limb, etc.). Traditionally, a martyr's relics are often more prized than the relics of other saints. Also, some saints' relics are known for their extraordinary incorruptibility and so would have high regard. It is important to note that the parts of the saint that were significant to that saint's life are more prized relics. For instance, King St. Stephen of Hungary's right forearm is especially important because of his status as a ruler. A famous theologian's head may be his most important relic. (The head of Saint Thomas Aquinas was removed by the monks at the Cistercian abbey at Fossanova where he died). Logically, if a saint did a lot of travelling then the bones of his feet may be prized. Current Catholic teaching prohibits relics to be divided up into small, unrecognizable parts if they are to be used in liturgy (i.e., as in an altar; see the rubrics listed in Rite Of Dedication of a Church and an Altar). 2.Second-Class Relics: An item that the saint wore (a sock, a shirt, a glove, etc.) Also included is an item that the saint owned or frequently used, for example, a crucifix, book, etc. Again, an item more important in the saint's life is thus a more important relic. 3.Third-Class Relics: Anything that has touched a first or second class relic of a saint. Given the importance of relics and their widespread commercial abuse in the Middle Ages, the sale of relics is strictly forbidden by the Roman Catholic Church, which decrees, "It is absolutely forbidden to sell sacred relics." (Code of Canon Law, §1190 §1). ↑ Ernest Brehaut, in his introduction to Gregory of Tours, analyzes the 6th-century meanings of sanctus and virtus.Retrieved January 16, 2008. This page was last modified on 8 July 2015, at 21:49.